JERUSALEM ““ Despite the international outcry following last week’s lethal confrontation between Israeli commandos and militant pro-Palestinian activists aboard a Turkish vessel carrying humanitarian aid to Gaza, Israel insists its naval blockade of the Hamas-ruled territory is justified and will continue. But even Israel’s closest allies backing the blockade as a legitimate means of cutting off weapons supplies to the Hamas regime, with which Israel is in an official state of belligerency, have been critical of the wider siege, which they say is hurting the people of Gaza far more than their fundamentalist rulers. The new international predicament in which Israel finds itself raises a number of fundamental questions: How necessary is the blockade and how effective has it been? Why was it imposed in the first place? Why was it accompanied by a wider siege blocking civilian goods and movement? And what should Israel do in the face of the storm of international protest? The blockade-siege in its present form was imposed in June 2007. Hamas won a majority of parliamentary seats in Palestinian elections in 2006, and it formed a unity government with Abbas’ Fatah Party. The following year, Hamas staged a violent coup and took complete control of Gaza. Israel and Egypt responded by closing land crossings into Gaza, and Israel reinstituted a naval blockade on the Gaza coast. Israel’s rationale was that after hundreds of Hamas-inspired rocket attacks, it needed to do whatever it could to keep weapons, weapons’ manufacturing parts, and bunker-building materials out of Gaza. The siege, which also limited civilian supplies, was intended to put pressure on Hamas to release captured Israeli soldier Cpl. Gilad Shalit and possibly even to induce popular rebellion against Hamas. In September 2007, following dozens more rocket attacks, Israel officially declared Gaza “a hostile territory,” buttressing legal justification for its hostile moves against it. Moreover, by stifling economic development and living standards in Gaza while promoting them in the west bank, Israel was signaling to the Palestinians that Abbas-style coexistence would get them further than Hamas’ blanket rejectionism. The Egyptians, concerned that Hamas radicalism could spill over into their territory, argued that opening their border with Gaza would imply recognition of the Hamas government and further undermine the legitimacy of the PA. Formally Egypt insisted on faithfully carrying out the provisions of a November 2005 agreement that provided for supervision of its Rafah crossing point with Gaza by PA and European monitors, a provision rejected by Hamas. The 2005 “Agreement on Movement and Access” was meant to put the finishing touches on Israel’s unilateral pullout from Gaza two months earlier. Brokered by the United States, the aim was to ease the movement of people and goods in and out of Gaza and thus enhance Palestinian productivity. Under its terms, the main land crossing points at Rafah, Kerem Shalom, and Karni would be fully opened. There was no thought at the time of a naval blockade. On the contrary, work on a feasibility study for an independent Palestinian deepwater port in Gaza was under way. Dov Weissglas, then Prime Minister Ariel Sharon’s right-hand man, says that with Israel out of Gaza, the Palestinians promised an economic miracle, arguing that without the occupation to hold them back, they would show the world what Palestinians could do if given a chance and turn Gaza into a new Singapore. According to Weissglas, plans for five-star hotels along the coast and an airport at Dahaniya were far advanced, with former World Bank President James Wolfensohn, then the international Quartet’s special representative, playing a leading role. The idea was to underpin peace between Gaza and Israel through economic progress, much as in the west bank today. The Hamas takeover, however, put an end to the Singapore dream. Stepped-up Hamas rocket attacks on Israeli civilians eventually led to Operation Cast Lead, the Israeli land invasion of Gaza in December 2008. After the war ended a month later, Israel’s main concern was to prevent Hamas from rearming. Talk at the time had German, French, and British ships patrolling the Gaza coast to prevent arms smuggling. But when the idea fell through, mainly at Egypt’s insistence, Israel was left on its own to monitor maritime traffic for weapons. Last November, Israeli Navy vessels intercepted the Francop, an Antigua and Barbuda-flagged ship that was carrying hundreds of tons of Iran-supplied weapons for Hezbollah in Lebanon and possibly also Hamas. 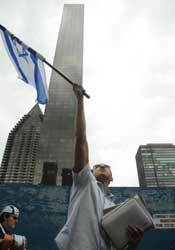 More than 700 people turned up to show their support for Israel at the StandWithUs rally held on June 3 in Times Square. Hundreds more stopped to watch footage of the IDF boarding the Mavi Marmara while StandWithUs regional coordinator, Avi Posnick, narrated the events. On June 9, the organization co-sponsored a rally at the Israeli Consulate, drawing some 2,000 people. Hamas has been able to continue smuggling weapons through tunnels along the border between Gaza and Egypt. The Israeli fear, though, is that large ships could bring in much bigger rockets and missiles, possibly even game-changing weapons such as the accurate medium range GPS-directed M-600s Hezbollah has received from Syria. Israel sees Gaza and Lebanon as two Iranian forward positions and part of a much wider regional threat. 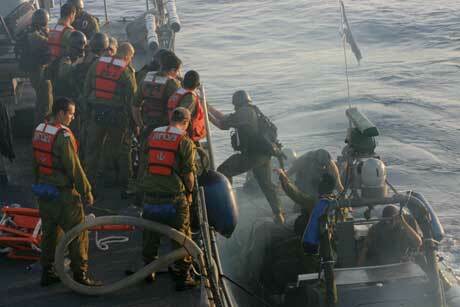 Many of Israel’s friends recognize its need to check ships approaching the Gaza area for weapons. But there is far less understanding for the limited inflow and often arbitrary exclusion of civilian goods – for example, keeping out unsupervised cement and steel that could be used for building bunkers or making weapons makes sense. And critics ask why thyme, coriander, chocolate, and macaroni are on the exclusion list. Some critics say the limited influx of goods is causing a humanitarian crisis. Others argue that even if it isn’t, the restrictions constitute a form of collective punishment, which is illegal, even between warring parties. Israel maintains that no humanitarian crisis exists in Gaza and that it is doing more than enough to prevent one. According to the Israel Defense Forces, which coordinates aid to Gaza, Israel in the first three months of 2010 sent in more than 3,600 trucks with approximately 100,000 tons of fruit, vegetables, meat, chicken, fish, dairy products, animal feed, hygiene products, clothing, and shoes, as well as 1,000 tons of medical equipment. Moreover, 10,544 Gaza residents were treated last year in Israeli hospitals. According to Western figures, the average life expectancy in Gaza is 73.68 years, compared to about 40 in some African countries, and there is as little malnutrition as in the West. Israel also supplies 60 percent of Gaza’s electricity, its fuel needs, hypochlorite for water purification, electricity grid repair parts, and glass to fix windows, as well as cement and iron for building, under strict supervision. According to U.N. figures, updated to Jan. 30 of this year, 78 percent of homes lightly damaged in the 2008-09 Gaza war have been repaired. Other observers go even further, pointing to the well-stocked markets in Gaza, the emergence of gourmet restaurants, and the recent launching of a new Olympic-size swimming pool. Human rights activists contend that although there is plenty of food, not everyone can afford to buy enough to meet basic needs. They say 70 percent of the factories in Gaza are closed, 40 percent of Gaza workers are unemployed, and 60 percent of households are “food insecure” – that is, they can’t be sure of having enough cash for their minimal food needs. Whatever the true state of humanitarian affairs in Gaza, there is increasingly little tolerance from friends or foes alike of Israel’s limitations on the inflow of civilian goods. To some extent, it seems, continued Israeli insistence on the civilian blockade could undermine the far more vital military blockade. And that’s precisely what the militant blockade runners aboard the Turkish Mavi Marmara and others that might follow are trying to achieve: to delegitimize Israel’s blockade altogether and enable the free entry of all ships to Gaza, even those carrying military cargoes. Israelis are divided over how to go about maintaining the blockade. The government argues that the best course of action is to make Israel’s moral and legal case, and expose the delegitimizers. The opposition retorts that Israel can only hope to deflect international criticism by embracing credible peace policies. In other words, that criticism of Israel was so spontaneous and severe after the confrontation on the high seas because the government was widely perceived as not being committed to ending the occupation. Opposition voices also suggest that the government should rethink the civilian siege, which they say has not achieved its goals: After four years in captivity, Shalit has not been released or even so much as allowed a visit by the Red Cross, and there is little sign of the siege sparking an anti-Hamas uprising. They conclude that the failed policy is costing Israel heavily in diplomatic coin, leaving it more isolated than at any other time in its history. The government faces some big decisions: First, whether to allow an international presence in an inquiry into the confrontation aboard the Mavi Marmara; second, whether to ease the civilian siege to ensure continued international backing for the military blockade; and third, whether to present a new initiative on peacemaking with the Palestinians.